Does Jesus want miracles for our lives? There are a few things that stand out for me here. First, Peter’s instinct is remarkable. I’m trying to imagine myself as Peter, and wondering what he was thinking about. Yes, he’s seen Jesus working miracles. But at this point, there have been few, if any, that impacted any of the disciples personally. Yet when Peter – in the middle of the night – realizes that he’s not seeing a ghost on the waters, but his teacher, doesn’t merely look on in wonderment or glorify God. 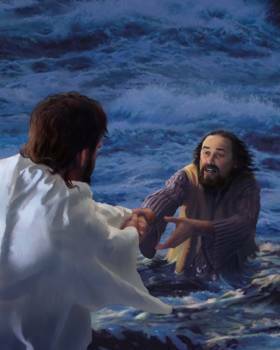 He asks Christ if he, too, can walk on the water to meet his Master. To me, that speaks to a special kind of faith. A faith that essentially blocks every fact – including the law of gravity and any knowledge about the physical properties of water – and focuses every ounce of his being on his Christ and the desire to be with him. How often is my faith so exclusive? How often does my faith produce the kind of Christ-centered tunnel-vision that Peter experienced? The second thing that made me really put on my thinking cap this morning was Jesus’ response. He didn’t say, “hang on, Pete, I’ll be there in a minute.” He didn’t say, “Peter, don’t waste my time with foolishness – just wait in the boat.” He simply said, “Come.” I imagine him smiling in a combination of joy and amusement at Peter’s childlike faith. And it made me wonder what I would be capable of – in Christ – if I just asked earnestly to walk with my Master. Would anything be impossible?